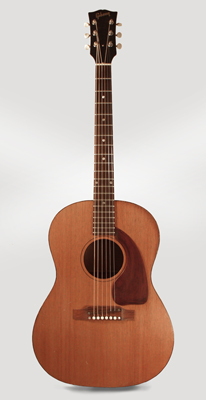 Gibson LG-0 Model Flat Top Acoustic Guitar (1966), made in Kalamazoo, Michigan, serial # 804091, natural lacquer finish, mahogany body and neck, rosewood fingerboard, original brown alligator chipboard case. Overall length is 39 1/2 in. (100.3 cm. ), 14 3/8 in. (36.5 cm.) wide at lower bout, and 4 1/2 in. (11.4 cm.) in depth at side, taken at the end block. Scale length is 24 3/4 in. (629 mm.). Width of nut is 1 11/16 in. (43 mm.). Overall this guitar does not show a lot of wear, just some light scratches and small dings to the surface finish. Very solid with no cracks or repairs; the only issue is that the tortoise celluloid binding around the top edge has begun to deteriorate in a couple of places, and the finish has darkened slightly in those areas. The Celluloid is still solid and not crumbling, just a bit shrunken with small cracks and discoloration. Overall this is a very nice player with a surprisingly sweet sound. This LG-0 has the original adjustable-saddle rosewood bridge and is a much better sounding and playing instrument than those with the ill-fated molded plastic bridge. All original including the original chipboard case. Overall Very Good + Condition.